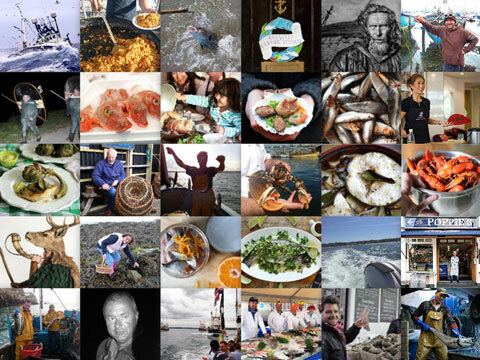 You can’t beat seafood cooked outdoors, whether you’re at home, camping or on the beach. So here’s our al fresco kitchen guide by barbie specialist Marcus Bawdon. 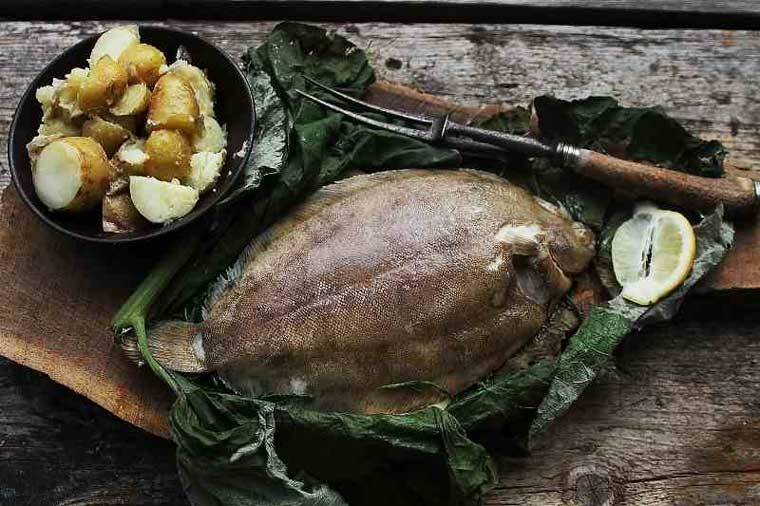 Anything from a simple campfire to the latest hi-tech all-singing, all-dancing smokers and barbecues will work fine as fish generally don’t require long cooking times. My choice is to cook with good quality lumpwood charcoal. Avoid “instant” lighting charcoal or briquettes, which have additives that taint the fish easily. Don’t use chemical-laced firestarters or lighting fluid either. Fish fillets and steaks work best simply grilled over medium-hot coals, but larger fish such as salmon and bigger bass need slower cooking on a barbecue with a lid, which essentially turns your grill into a smoky oven. Managing heat on a charcoal barbecue is as easy as controlling the air flow. If you want your barbecue to heat up quickly, leave the lid off and allow plenty of air to get to the coals: ideal for rapidly cooking thin fillets of fish, prawns and mixed skewers. To slow things down, put the lid on and use the vents to control airflow to cook or smoke larger fish at lower temperatures. 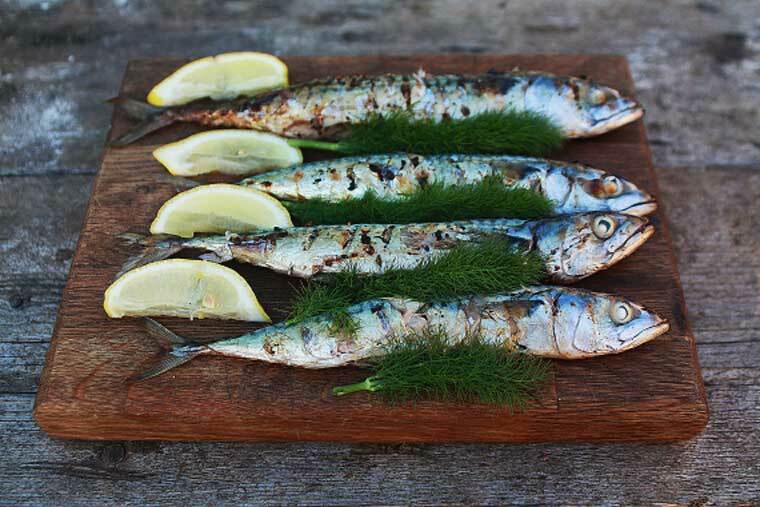 We’re so fortunate to have so many wonderful species of fish in our seas, but which are the best for the barbecue? 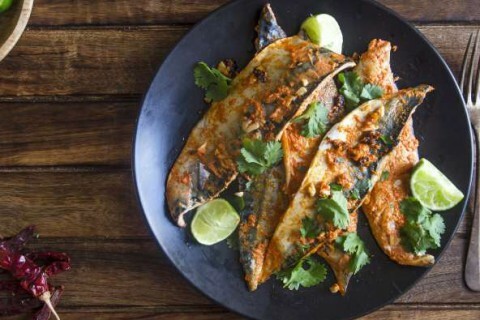 For me the pinnacle is the oily fish: line-caught mackerel and Cornish sardines with glorious crisp skin and juicy flesh. The fresher the better! 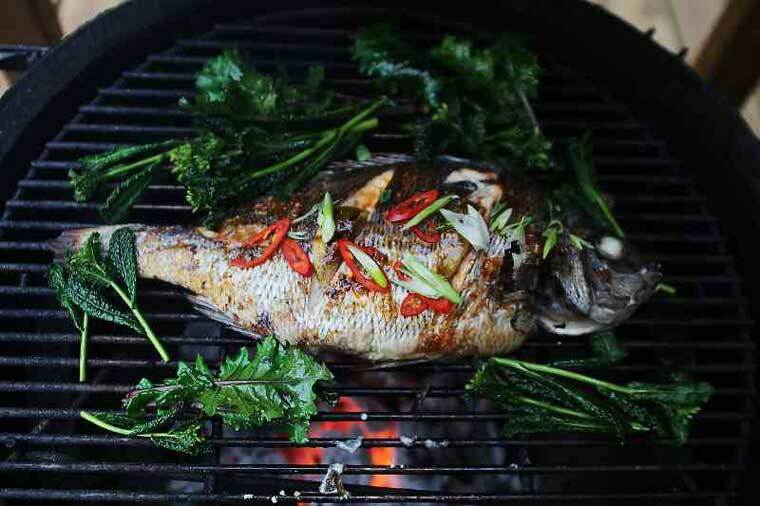 Whole fish such as sea bass or black or gilthead bream are a real treat too: try my sweet chilli barbecue bream recipe. Shellfish can be wonderful too. 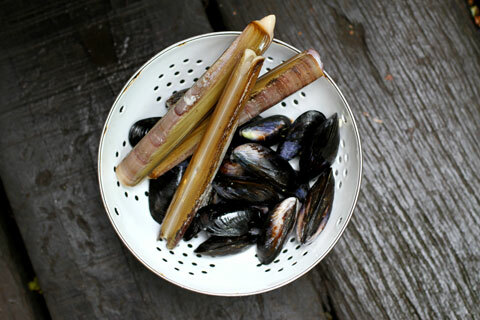 Try razor clams. Grill them meat side down directly over white hot coals until seared – just a couple of minutes – then turn them over with some tongs, brush them with garlic, chilli and coriander butter, a squeeze of lemon and a little salt and pepper, and grill for another couple of minutes, until the shells start to char and smoke. Don’t overcook them or they’ll turn to rubber! The aroma and flavour are amazing. • Place delicate fillets on an oiled plank of cedar or oak to smoke and keep moist: see below. Fish cooks very quickly on a hot barbecue. Cook it quickly and the fish will stay moist and won’t dry out: a few minutes each side for most fillets should do the trick. Obviously, a larger whole fish will take longer: reckon on 10 minutes for a mackerel, 15-20 minutes for bream and bass, 30 minutes for a medium-sized trout and 40 minutes for a whole salmon. You can use wood chips to add a smoky flavour to the fish, but only use varieties that generate a light smoke: my favourites are birch and beech. Make sure you don’t overpower what you’re cooking. Think of smoke as a seasoning: it’s easy to add, but once it’s overdone you can’t go back, so go gently. A couple of pieces will be plenty to start with. If you have a gas barbecue, you can still get the same smoky effect. Just pop a few wood chips in a foil pouch, pierce it in a few places and place it near the flame. Then turn the gas down low, shut the lid and you have a hot smoker. Reckon on about 40 minutes for wonderful hot smoked mackerel. Another great way of cooking fish is to place it on a plank, which protects it from the direct heat and stops it from drying out, allowing it to roast and smoke to perfection. Take a couple of salmon fillets, add a little sea salt and a pinch of barbecue seasoning, then place them on a birch log rubbed with a little olive oil to stop it sticking. Nestle the log in the medium-hot coals of barbecue, shut the lid and leave it for 10-12 minutes. 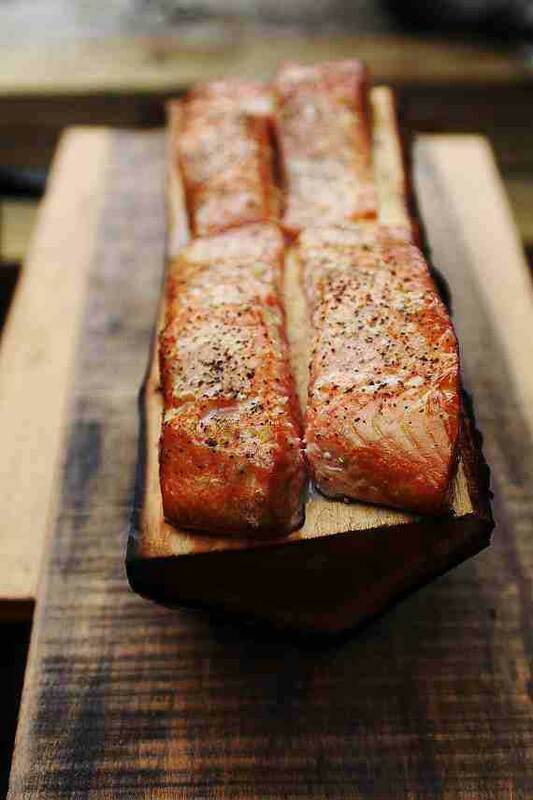 The bottom of the log will char up and the sweet birch smoke will go right through the fish. Make sure you have some heavy duty oven gloves or tongs for removing the log, then serve with salad and some herby couscous. 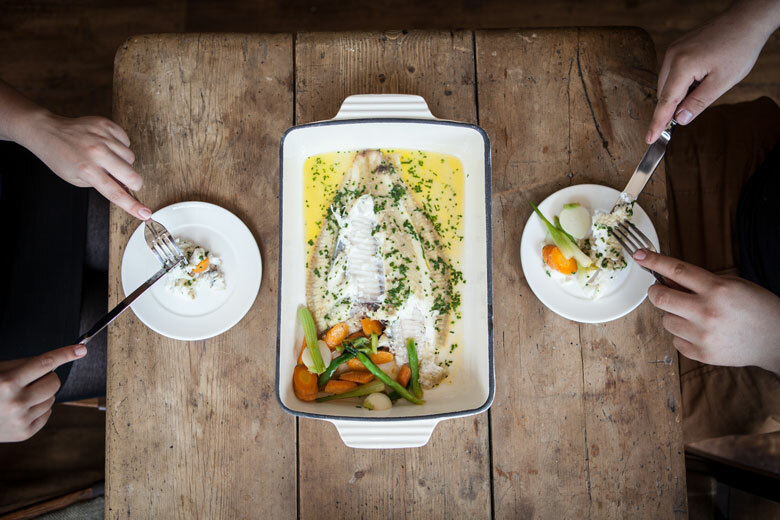 Instead of just grilling a few fish fillets, why not have a full-on fish feast? 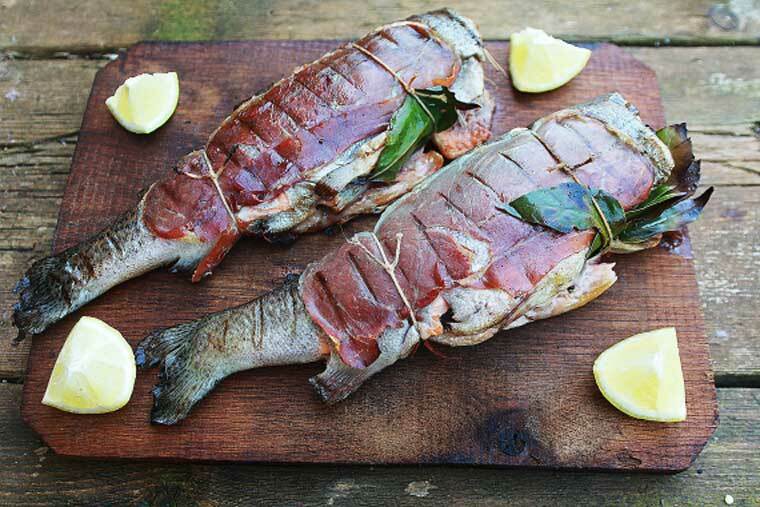 Barbecue up a couple of wonderful whole fish such as sea bass or bream as a centrepiece, alongside barbecued prawns, mussels and oysters, pour over some lovely garlic and parsley melted butter, have lots of bread to hand and get stuck in with your hands. Absolute heaven – and so easily done! 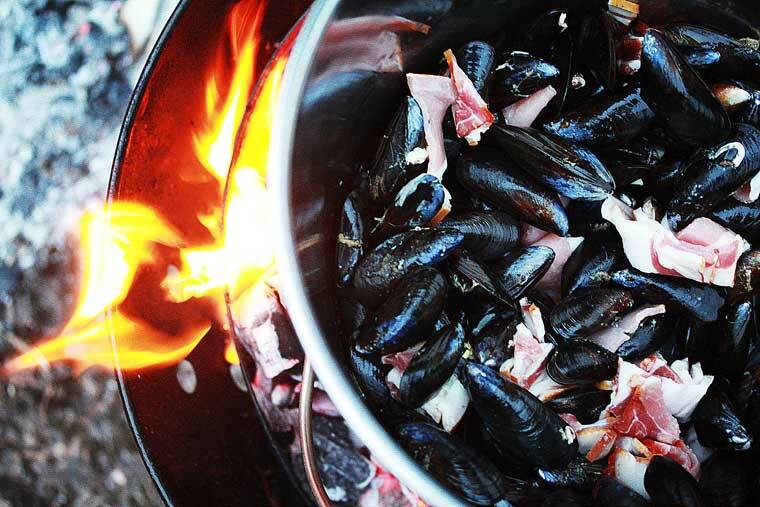 Alternatively, another really easy way to feed a crowd is to cook up some mussels in a bucket, either sat straight on top of the barbecue or in the embers of a campfire. Just take a good, clean stainless (not galvanized) steel bucket, stick it in some embers or on top of a nice hot barbecue and use it like a big saucepan. Coarsely chop a few rashers of smoked streaky bacon and a couple of shallots and fry off in the bottom of the bucket. Add some finely chopped garlic and a handful of flat leaf parsley. Add the mussels, a bottle of cider and cover to steam for 5 minutes, until the mussels have fully opened. Give the bucket a shake. stir in some more chopped parsley and some fennel or dill, and add a couple of spoons of crème fraîche or thick cream. Then pour the entire contents of the bucket on to a big platter, throw over some more parsley and fennel or dill, and serve with hunks of good bread and butter and a glass of cold cider. Marcus Bawdon is a dedicated foodie and barbecue enthusiast who blogs at CountryWoodSmoke. He’s also author of the iPad-friendly e-cookbook Smoky & The Woodpit, which features 20 meat, seafood, flatbread, pizza and pud recipes – all made on the barbie. It’s available via Books on iTunes for £1.99. 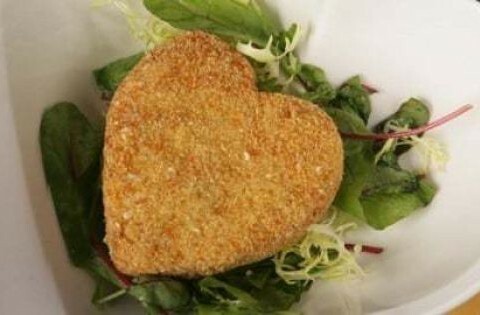 For a bit of fun, we have the Heart Salmon Fishcake because nothing says “True Love” like a fishcake! A really simple fishcake recipe that you can make in any shape you like.